We feature miniature furnishings for today's dollhouse miniature home from Mid-Century Modern to Classic Rustic Urban. Think of us as your source for that Atomic Ranch Rambler, fun Beach House, Urban Loft, or re-imagined Farmhouse. I am constantly searching for pieces that are "Trending" today in full size design. Our specialty: designer created Bedding Sets and Window Treatments available in our online store as well as custom in your choice of fabrics. 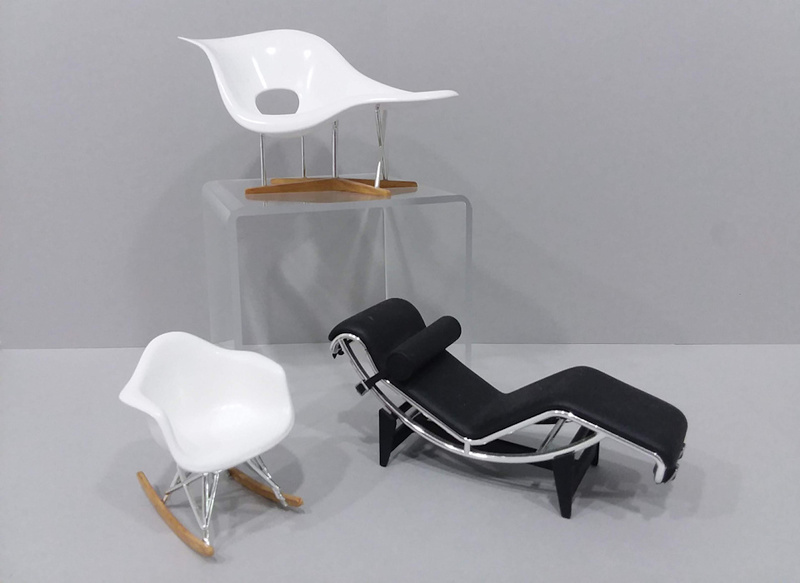 Are you searching for an iconic Mid-Century Eames Lounge Chair or Contemporary Platform Bed for your dollhouse? We have it. Do you need a Country Casual sofa for the beach house? We have it. All at very affordable prices. Take a look at our Furniture selection and see what inspires you. 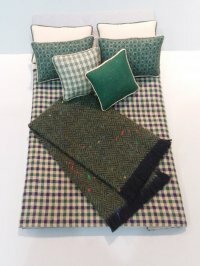 With 35 years of design experience I have created "ready to go" quilt & pillow sets for your miniature bed. Most designs are available in single and double bed sizes. 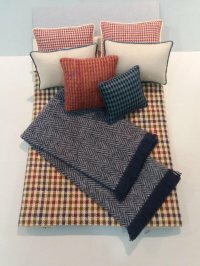 If you have a bed that needs "dressing", or need to purchase a bed, you will find several styles available to purchase from my site. You will find a selection of Dressed Beds in the Furniture category. Do you need custom bedding for your bed? We can make the bedding in your choice of fabrics. Just contact me by email or phone to discuss the possibilities. 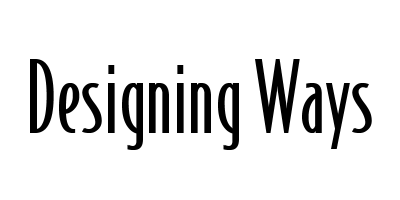 If a stock item shows 0 stock available we can have it ready to ship to you in 3 to 4 weeks. Extra pillows are available in any fabric shown by custom order. Fringed throws that are included with some of the bedding sets are available separately. See the current selection under the Fringed Throws Category. 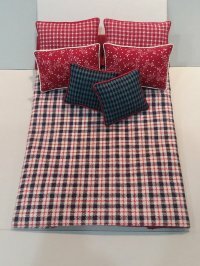 The choice of designs for the bedding sets changes from time to time. Check back often for the newest styles. Don't forget those bare windows in your room setting. We have ready to purchase basic Roller Shades, Bamboo Shades, Balloon Valances and Balloon Shades. View our selection under the Window Treatment category. For over 20 years I have been creating custom window treatments with the help of a very talented artisan, Janet Nowicki. We can dress your mini windows with anything from Modern Grommet Drapes to elaborate Swags and Draperies and everything in between. See the many examples under the Special Orders category. Don't see what you're envisioning for your room? Send me a photo of what you would like us to create. Having trouble finding Modern Lamps for your miniature room setting? We have found a LED battery operated Table & Floor Lamp that is "at home" in a Modern, Art Deco or Traditional setting. See our complete selection under this category. When I find other Lighting or Accessories that compliment my line of products they will be added to the site. More accessories are available when I am attending a show. Be sure to check my Upcoming Shows listing. Thanks for browsing. I hope you found things that will inspire you to venture out and "go modern" even if you didn't intend to. Please visit often and see what's new.